Each AppInsights plan offers a set number of dashboards and users. As mentioned earlier in this doc, you are not limited by the number of data sources / authentications or widgets on your dashboards -- you are only limited to the “real estate” (24x12 grid) provided by each of your dashboards. For more details on each of our plans, and their corresponding prices, please check-out our pricing page. AppInsights offers both monthly and annual payment options. If your trial period has come to an end, but you’re still interested in evaluating AppInsights without making a long-term commitment, our monthly plans might be the most fitting option for you. If you’ve seen the long term value of AppInsights and are interested in introducing the app as a permanent fixture within your company or team, our annual plans are the ideal route for you! Not only are they 10% less expensive (vs. monthly pricing, annualized), but you will also receive several promotional items through our HDTV + Chromebit promotion. While our documentation is intended to be comprehensive in describing the capabilities of the AppInsights platform, it’s possible that you’ll hit some snags along the way. You’ve probably already noticed several links throughout this document that connect to helpful "how-to" and "getting started" tutorials. If you’d like to explore all of our support resources, or post a public question to the AppInsights user community, visit our support portal. If you have a particularly technical question, you can also send a direct our support team. We’d love to hear from you! Customer feedback is essential in determining where we focus our product improvement efforts, so don’t be hesitant to share your thoughts about desired changes or suggested features. 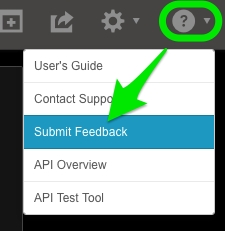 Just open the “Help” menu and select “Submit Feedback” to tell us what you’re thinking anytime you’re logged in! At AppInsights, we’re committed to providing our users with an experience that is constantly improving. While plenty of these improvements take place behind the scenes, new features and noticeable customer-facing app improvements are always in the works. Make sure to check out our monthly newsletters, and keep an eye on our blog, for updates on what we’re working on.